GE began producing slate appliances around 2013 before the big surge in alternatives to stainless steel began to take hold in 2017. GE is the exclusive producer of slate appliances in the marketplace today. Even though the color isn't new, it deserves to be included in your color scheme choices when looking for new appliances. Let's check out the reasons why! Magnetic - so you can still keep your vacation souvenirs on your refrigerator! It's currently available on over 50 GE products, so you'll have access to a broad range of options to complete your kitchen appliance suite. Another thing to remember about slate is that it goes beautifully with white kitchen cabinets which are very popular in new construction and kitchen remodels at the moment. Slate can accentuate both earth tones and metallic tones in your kitchen, making it a versatile choice for a range of different color schemes and styles. Whether you are looking for a warm, inviting aesthetic or something more industrial, slate can work for either of them! The matte finish is also a great option if fingerprints and smudges on stainless steel drive you up the wall. From basic models to premium and high-end options, you have a lot of choices when it comes to choosing a slate kitchen suite. Next, we'll go over what you can expect in terms of pricing and options for kitchen appliances in slate. If you want to skip that, click here to view all GE slate appliances! Otherwise, keep reading. 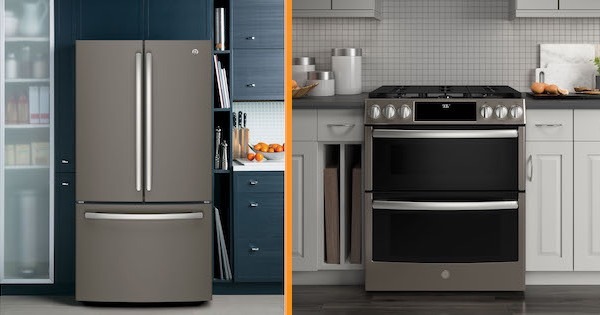 Click here for current GE appliance rebates! Pricing starts at $899 for top freezer refrigerators and around $1,699 for French door, side by side, and bottom freezer models. 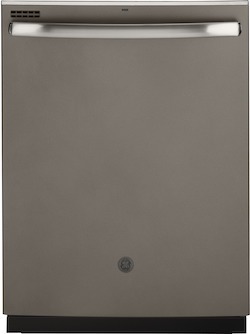 For smaller kitchens, the 17.5 cubic foot top freezer refrigerator model GTE18GMHES at $909 might be a great choice. Or you could go big with a 27 cubic foot French door model, the GNE27JMMES at $2,199! From basic models to more advanced designs, like their refrigerator with Keurig built in, you have a wide range of options to choose from! Most fully featured, nicely sized models are in the $1,599-$2,199 range. One middle-of-the-road model is the 30" wide 21 cubic foot bottom freezer model GDE21EMKES at $1,799. Pricing starts at $609 for GE slate dishwashers with front controls, while top control models start at around $709 - learn more about top control vs front control dishwashers in our article! These models all look similar from the outside but vary in their internal controls and options. Many have stainless steel interiors and include features like bottle jets in the upper rack and more. 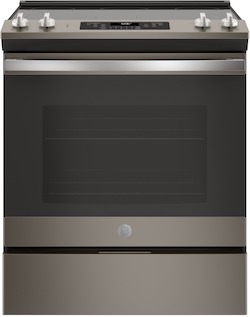 One top seller in slate is the GE GDT605PMMES, priced at around $709. Most of GE's slate ranges start at around $1,000. You can find a GE Professional freestanding range for as low as $1,299. Slide-in ranges start at $1,599, while double oven models are typically closer to $2,000. Single wall ovens start at $1,649 for models from the main line, and you can get a built-in convection microwave oven for a similar price point. Double wall ovens start at around $2,399, and GE Professional models are often in the $3,000 range. For example, this slide in electric range is priced at $1,709 - the GE JS660ELES. 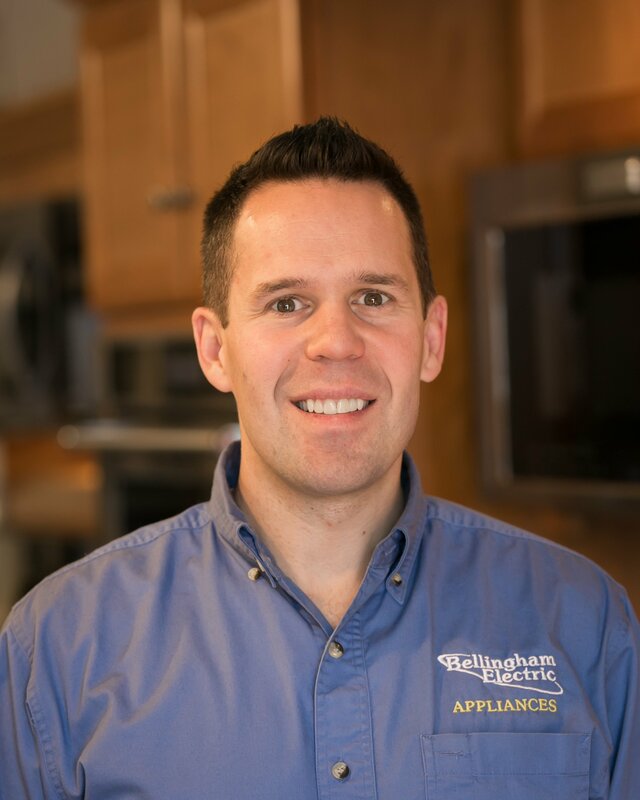 Click here to view current GE appliance packages! 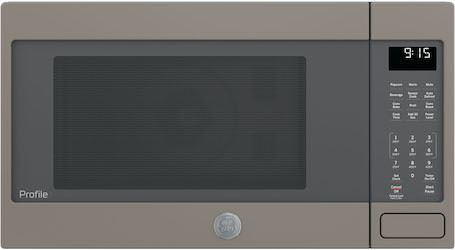 One countertop convection microwave is the 1.9 cubic foot capacity GE Profile model PEB9159EJES priced at $739. We hope you've enjoyed this review of GE Slate Appliances. There are many colors to choose from in today's market but slate should certainly not be overlooked. If you are looking for a complete overview of all the new colors on the market, check out our article - New Appliances Colors - Black Stainless, Black Slate, Black Matte & More. Can't get enough of GE? They recently came out with another new color selection with customizable hardware: the GE Cafe Matte Collection. Click the link to read more! Please leave us a comment below. We'd love to hear your feedback on slate appliances!